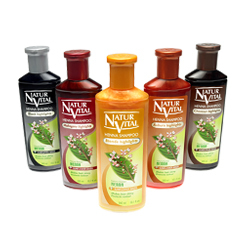 My friends have so much praise for Natur Vitals Shampoos and conditioners. They say the shampoo is not too harsh on the hair and it gives it shine. So I went to Sahad Stores and bought a bottle for N1000. I wanted the conditioner but I bought the Shampoo by mistake:) (don't ask how). Its major ingredients are lawsonia inermis (henna) extract, and helianthus annuus (sunflower) extract. Henna obtained from crushed dried henna leaves makes the hair shiny and strong and gives it lots of body. It also brightens natural and dyed hair colour. Will I buy another bottle? Yes. When I get back from camp (compulsory youth service) I will buy the conditioner and give a review. Peace!! I really like this shampooes. Have been using them during my living in europe. Is there any shop in manhattan,NY that I can go and buy them instead of online buying? Thank you!